ASK Brooklyn Museum is a mobile application for iOS and Android that enables visitors to ask questions when they are onsite and experts answer in real time. ASK Brooklyn Museum is a mobile application for iOS and Android that enables visitors to ask questions when they are at the Brooklyn Museum and experts answer in real time. Visitors are connected with a specially trained team who answer queries with the aim to encourage closer looking at artworks, to draw connections to nearby works, and to offer recommendations for what else to see at Museum. ASK uses Estimote beacons to identify the works of art visitors are standing near and the location is sent to the team so they can better assist the public. The data from the project—in the form of questions and answers tagged to object identification—is shared across departments so that it can inform decisions related to all aspects of the visitor experience, in particular interpretation. ASK Brooklyn Museum was developed with a user-centered approach for concept, design, and build. Project leaders adopted agile planning methodology, an iterative process that relies on testing directly with visitors throughout planning, development, and deployment. ASK was developed over the course of a year relying on pilot testing ideas directly with visitors in an iterative process. Through testing, we discovered that our visitors are naturally conversational and wanted to talk about art, at length, with real people. Visitors wanted to know more about what they were seeing and where to go next, but they wanted this information in a form that was wholly dynamic to their individual needs. In a final pilot, visitors were given iPod touches with iMessage connecting to our Chief Curator who answered their questions as they explored the galleries. Visitor feedback indicated a love of the dynamic and personal nature of the experience. Visitors also reported finding themselves looking at art more closely as a result of trying to figure out which questions to ask. 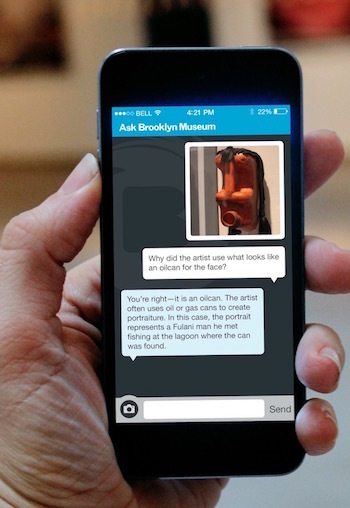 This text message model connecting visitors with experts would become ASK Brooklyn Museum—a five-star rated mobile application for iOS and Android (April 2016) with app store reviews reflective of early feedback. 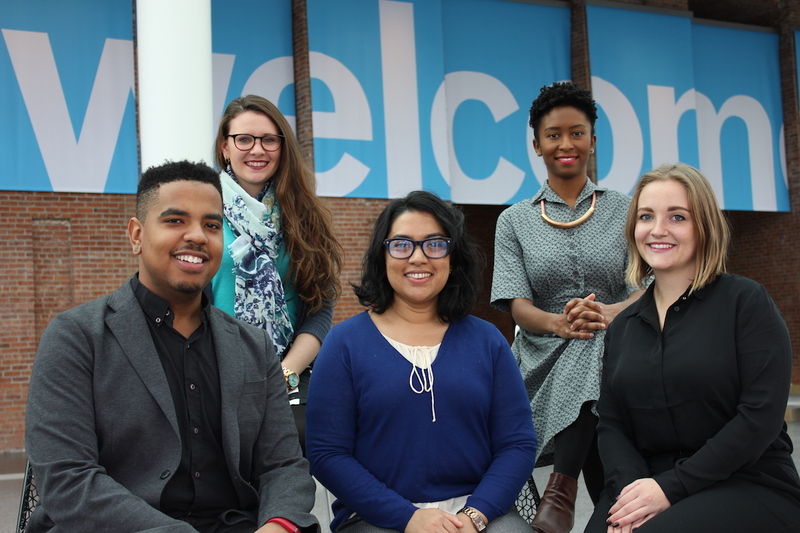 The ASK team is comprised of a group of full-time and part-time staff who have varied backgrounds in the arts and education and degrees in art history. 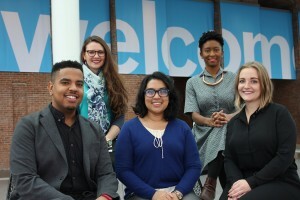 The ASK team is led by a full-time Audience Engagement Team Lead and comprised of a group of two full-time and four part-time staff who have varied backgrounds in the arts and education and degrees in art history. They have ongoing training with curators and educators to give the them the knowledge needed to serve a diverse public in our encyclopedic collection. The team has developed a unique engagement model focused on text messaging which aims to take what may be a simple question asked by a visitor as a basis for a longer conversation. Personal recommendations are given based on interests and connections to nearby objects aim to get visitors exploring throughout the building. Closer looking at art is encouraged, directing eyes off the screens of the mobile device and onto the works in front of them. The result is a quantifiably deep engagement. Chat sessions are comprised of 13 messages on average with visitors asking questions in two or more galleries. The power users, which represent 20% of the total, ask questions in six or more galleries and conversations can last during the entire course of a three hour visit. ASK uses location aware beacon technology to identify which works of art visitors are standing near when they send a message. This information is displayed on the ASK Team dashboard and linked to our object database so the team has information available to best answer questions. Institution-wide learning is a critical part of ASK. At the end of each shift, the ASK team takes entire conversations and breaks them down into snippets—questions and answers—tagged to object identification. These snippets are reviewed by curators for accuracy and available to all staff so they can see what our visitors are asking us. This process encourages dialogue and informs decision-making for all aspects of our visitor experience. It was particularly useful during the recent planning process for several gallery reinstallations. Transparency and information sharing have been a key component of this project. The project team has published sixty posts to date on the BKM Tech blog, which outline the lessons learned throughout the development, launch, and run of the project. The technical team has open sourced all the mobile application side code related to ibeacon location aware technology. The ASK Team has released the engagement manual detailing how they answers questions. The ASK Brooklyn Museum concept was conceived by the team at the Brooklyn Museum working directly with visitors to pilot test ideas and concepts. The technical development and the iOS application were developed by the in-house Brooklyn Museum web team. The ASK Android app was developed out-of-house by Happy Fun Corp. The engagement model used for ASK Brooklyn Museum was created in-house. ASK consists of a team of individuals who answer questions coming in via the app, make connections, encourage closer looking, and give recommendations. 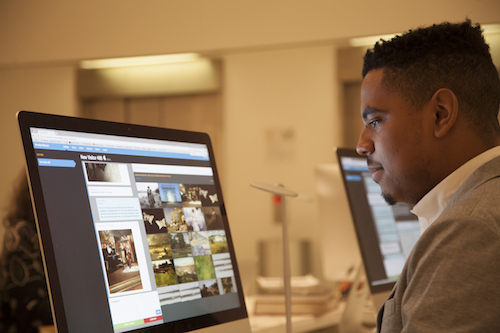 ASK Brooklyn Museum is funded by Bloomberg Philanthropies as part of their Bloomberg Connects program which seeks to enhance the visitor experience through technology.